Requires XNA, the redistributable is included in the zip, it must be installed. Random Game Idea: A game where you struggle against work. Description: We decided to create a game somewhat like the food minigame in “Misadventures of Tron Bonne” to follow the “struggling against work” theme. 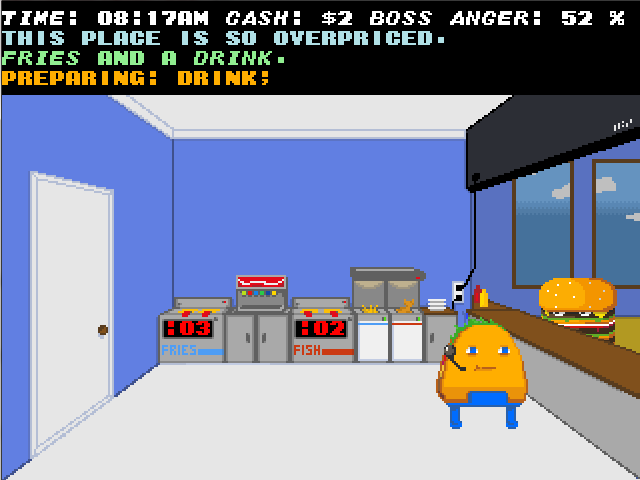 In that game, you just press a button to serve the right food to the customers, but in our game you have to go through a sequence to serve it. The actual struggle comes about with the random demonic possessions of the fryers. We wanted to make more crazy stuff happen but decided against it due to time constraints. Shoot the donuts, and don’t fall!